WHAT IS LAMP? WHAT IS LAMP? LAMP is an augmentative alternative communication (AAC) approach designed to give a method of independently and spontaneously expressing themselves through a speech generating device. This course will cover the components of LAMP: readiness to learn, engaging the learner through joint engagement, and learning language through a unique and consistent motor plan paired with an auditory signal and a natural consequence. Discussion will include how this approach addresses the core language deficits of autism, device features that are beneficial to teaching language, and how to use those features to implement LAMP components. Videos will be used to illustrate the treatment components. PRCs language system and devices will be used to illustrate treatment components; however LAMP principles can be applied to other products. Due to the limited duration of this course, hands-on time with devices will be limited to breaks. You may cancel up to two weeks prior to the workshop for a $35 cancellation fee. Within the two weeks prior to the workshop no refund will be available. Define the role of readiness to learn and shared focus in the implementation of AAC with children with ASD. Explain the importance of using motor patterning to develop motor automaticity for children with ASD who use AAC. Examine the use of a form/function profile as well as an interest inventory for use with children with ASD. Discuss implementation strategies for teaching children with ASD to use AAC. Discuss strategies for analyzing the efficacy of communication treatment. John Halloran, a speech-language pathologist, is the Senior Clinical Associate for The Center for AAC and Autism. John has worked in the field of AAC since 1994. He has a special interest in children who are challenged by severe physical or cognitive disabilities. He also finds much reward in exploring ways to best implement assistive technology with children who have autism. 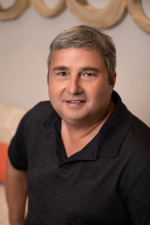 John Halloran graduated from the University of Arkansas at Little Rock in 1990 with a Bachelor's degree in Communication Disorders. He received his Master's in Communicative Disorders from the University of Arkansas for Medical Sciences in 1992. After graduation, he worked at Arkansas Easter Seals Rehabilitation Center, specializing in assistive technology. He has also owned a pediatric therapy clinic and after-school care for children with disabilities. He has taught augmentative communication at the University of Arkansas for Medical Sciences. John maintains membership in several professional organizations, including the American Speech Language Hearing Association and the Arkansas Speech Language Hearing Association. Financial: John Halloran is a salaried employee of The Center for AAC and Autism. Non-Financial: John Halloran is an employee-owner of The Center for AAC and Autism and is a member of ASHA and the Arkansas Speech Language Hearing Association. Live online classes: Participants wanting ASHA CEUs must be registered, "join" the class through his/her unique confirmation email letter, participate for the entire duration of the class, and pass a post-test with 80% accuracy or higher. No partial credits will be submitted. Participants have 15 days to submit all ASHA paperwork to PRC. ASHA paperwork received after 15 days will not be accepted. In-person classes: All ASHA paperwork must be submitted to the presenter by the end of the training day. Participants wanting ASHA CEUs for a multiple day training must attend all days. In addition, if there is a registration fee associated with the class and payment is not received, PRC will not submit your request for ASHA CEUs. The Prentke Romich Company (PRC) licenses a patented technology that is in PRC products trademarked as Accent™, PRiO™, NuEye™, and NuPoint™, as well as software Unity®, Essence™, CoreScanner™, UNIDAD™, LAMP Words for Life™, and our Language Acquisition through Motor Planning™ (LAMP) approach. PRC also has registered two websites, Realize Language™ and AAC Language Lab™. Because there are no other like-kind products available, course offerings will only cover information that pertains to the effective and safe use of the above-named products. This presentation will focus exclusively on Accent, PRiO, NuEye, NuPoint, Unity, CoreScanner, Essence, UNIDAD, LAMP Words for Life, Realize Language, or AAC Language Lab and will not include information regarding other similar or related augmentative and alternative communication (AAC) devices or software. Most of our presenters are salaried, employee-owners of the Prentke Romich Company. A few of our presenters are contracted presenters. This course is offered for 0.5 ASHA CEUs (Introductory level, Professional area). Payment: Registration may be paid by credit card or purchase order. A $30 processing fee will be applied to each purchase order. You must register each individual separately online with their own contact information. If registering more than 10 people, call 866-998-1726 to verify there are enough seats remaining. Refund: If you should need to cancel your registration for any reason, you may do so up to two weeks prior to the workshop for a $35 cancellation fee. Within the two weeks prior to the workshop, no refund will be available. We offer a 50% discount for parents who are considering the LAMP approach for their children and for students in professional programs. ASHA CEU's will not be processed for discounted registrations. Copyright © The Center for AAC & Autism. All Rights Reserved.